It's the first day of spring and I have been looking forward to this day all winter long! Colorado winters aren't so bad, in fact they are becoming increasingly mild, but there is just something about green leaves and grass that make me feel excited and energized. I visited my friend's house the other day and saw the crocus blooming in her flower bed and it honestly just made my heart warm up. I am so ready for SPRING! 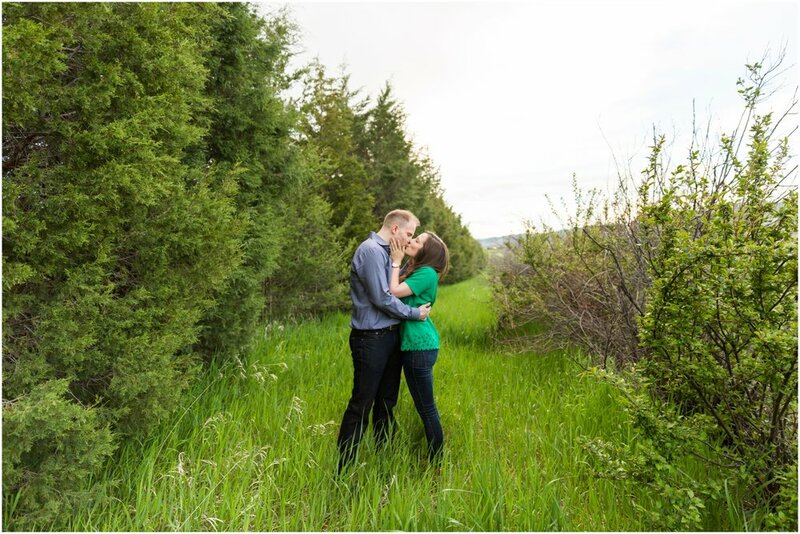 When I went to write this post, Megan and Tyler's engagement session at the Botanic Gardens at Chatfield in Denver was the first one to pop in to my head. It is filled with GREEN - even Megan is wearing it! Some of my favorite photos in this session include the blooming trees in the background. Blooming trees are another one of my favorite spring things! Mostly I love the snuggles, and the soft kisses these two shared. It really was a lovely evening. This season has always brought hope and promise to me. Promise that winter WILL be over soon, and that I will be back out photographing the sweetest couples on happy sunny days. Hope that evenings will be filled with barbecuing on our deck, and cold beers in hand. What are your favorite spring things? I'd love to hear what you are dreaming of. Leave a note in the comments section for me!